Here at Aesthetics of Liverpool, we pride ourselves on pioneering brand new treatments in the world of facial and body aesthetics. So, when we heard about the arrival of the world’s best new aesthetic body sculpting device – EMsculpt – we knew it would be a great fit for our clinic. We are delighted to be the very first clinic in Liverpool to be introducing EMsculpt – the ground-breaking, revolutionary new treatment in body contouring. Our team are so excited to bring this innovative treatment to the people of the North West to offer them the very latest in body sculpting with a treatment that simultaneously induces both fat reduction and muscle growth. What can our clients expect from EMsculpt treatment? EMsculpt utilises the power of HIFEM® (High-intensity Focused Electromagnetic Field) energy to induce contraction of the muscles during treatment. Muscles represent about 35% of our human bodies, but at the moment, body sculpting aesthetic treatments have only been able to target fat and haven’t yet been able to help with the toning of muscles – until now. EMsculpt really is the first of its kind as the HIFEM® technology is able to penetrate through the skin to target muscle tissue as well as fat. This brand new technology means that clients can now ‘melt’ excess fat as well as gaining a strengthening and toning of the abdominal and gluteal muscles. During the 30 minute procedure, tens of thousands of contractions are sent through your muscle causing supramaximal contractions which will build and define your targeted muscle area without any downtime, pain or discomfort. EMsculpt has been FDA approved for men and women of all ages. The average increase of muscle mass is 16% and the average fat reduction is 19% meaning that every client can see real results with this treatment. EMsculpt is the ideal treatment for people who are looking to tone and build their muscles. The treatment lasts 30 minutes and it the equivalent of doing 20,000 sit ups or squats in this short space of time. This kind of repetition is not possible in the gym alone and so EMsculpt is perfect to help you contour your body to perfection alongside your training in the gym. We are proud to be the first in Liverpool to be able to help women in the North West get their pre-pregnancy confidence back with EMsculpt too. Women who have experienced diastasis recti – the separation of muscle during pregnancy – can see dramatic improvements and avoid the need for other more invasive, risky alternatives. What do the team at Aesthetics of Liverpool have to say? How do I book EMsculpt treatment? If you want to cultivate, contour and define your body with a totally safe, non-invasive procedure then EMsculpt is what you have been looking for. 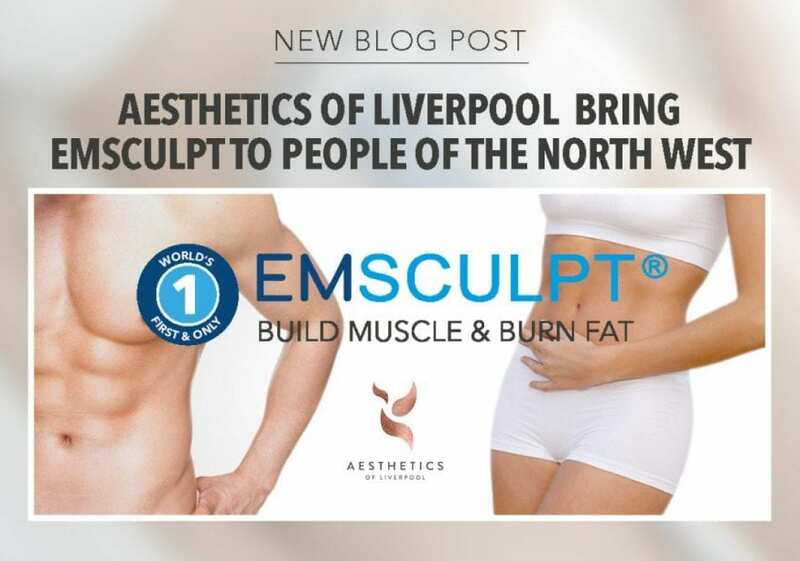 We offer EMsculpt in Liverpool exclusively, so you can get in touch with our friendly practitioners today at Aesthetics of Liverpool to learn more. We will be delighted to arrange a consultation and talk you through the procedure, show you the equipment and work with you to create a treatment plan to achieve the body of your dreams. Contact us here or call us on 0151 203 1393. We look forward to hearing from you soon!